Are you planning to separate your cells/ s-groups mechanically? If not, I would recommend you to, since from one s-group to another there will be only the thin pink PVC sleeve separating your cells (both cans of neighboring s-groups are negative but have 3,7V potential difference) and as soon as you use your battery pack/have vibrations those cells will (slightly) rub against each other till they short somewhere. So depending on how you will fix them mechanically that might be more or less an issue. I think your right. Thank you for the warning. My spot for the batteries has no extra room. I was not even going to use hot glue because I was afraid that would take up extra room. I was planning on just letting the spot welds and a little tape keep things tight. Hopefully I would have enough room on the out side for a layer of heat shrink. Now I am thinking 1 layer of some kind of tape between the series cell groups. If it grows too big I could redesign my electrical components to use less space. insulator on every positive side of each cell. I wrapped each parallel group Kapton tape. I did quite a bit of tests spot welds before I began. I tried lots of settings, I am not absolutely certain that my welds are good. None of the “for score” ones broke off, but I did not try that hard to break them off either. I did all my welds with the hand held tool, rather than the tool mounted to the spot welder. The hand held tool gets very hot, to the point it is hard to hold onto. The hand held tool also starts to melt and the spacing of the electrodes becomes sloppy. I operated at full power and almost full pulses. 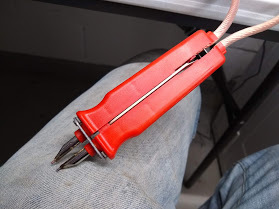 The heavy gauge wires that power the hand held tool jump and get hot each time you make a weld. Much of the available power is lost in the hand held tool wires. The electrodes that are mounted to the welder seem to have much more power. But they are difficult to use on a large battery. 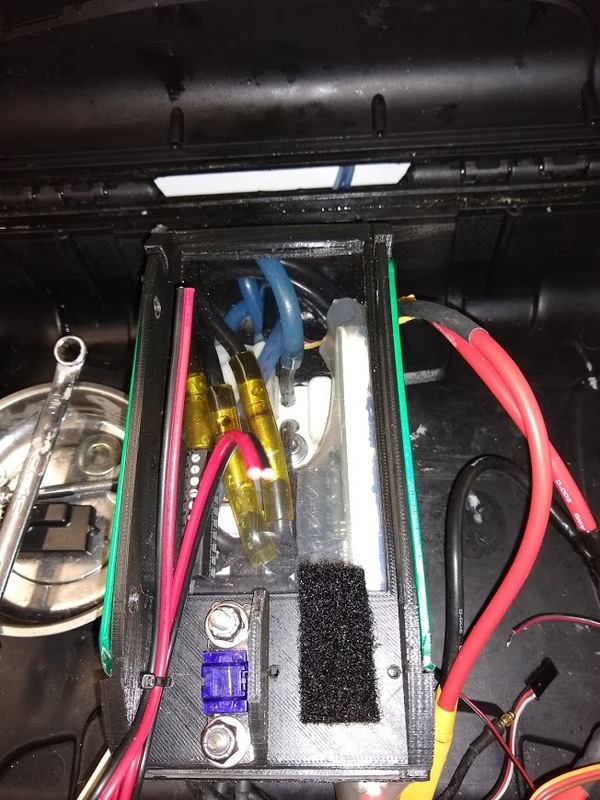 I managed to keep my batteries as tight as possible, Unfortunately they still slightly interfere with the enclosure lid closing. 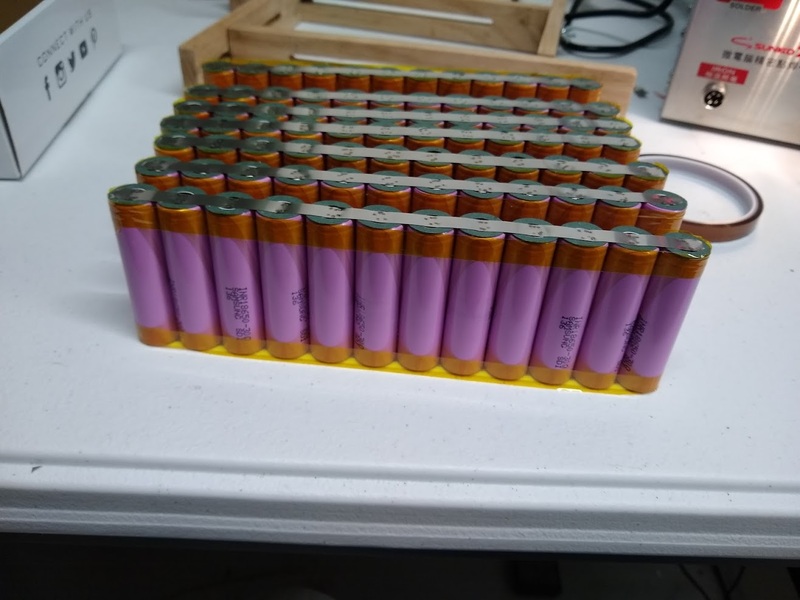 I need a additional 1/4" space on each side to fit all the batteries in.
. So I need to make the already too tight electronics fit in a 1/2" smaller space. In my built i used the top of the case to fit some off the stuff… What is your plan for the bus bar ? So I need to make the already too tight electronics fit in a 1/2" smaller space. No room there. I only have about 1/2" above the batteries. That orange aluminum frame that sticking up on each side of my electronics has 3.5" between them. That frame helps support the lid when the lid is closed. I did that so I could put all my weight on the box without it crushing in. As far as the buss bar goes Its nothing special. I took some 10 gauge super worm silicone wire and pulled the insulation off it. There 7 bundles of strands inside. I evenly distributed them along the length of the nickel. I decided to go with 10 gauge rather than 8 gauge because I plan to use XT90 connectors. I sanded the Nickel strip before I soldered. I tried to be quick with the solder operations so I would not damage the batteries. I ordered some of this Nickel Belt. It looks like it should work really well. But I don’t see many people using it. Any feed back? I also ordered a 8S balance charger and 8S balance leads. I’m using nickel strip for my packs. I have a continuous roll. I’m not sure if it is really only nickel or nickel coated steel (e.g. hilumin by tata steel). The steel ones probably have higher resistance, but I don’t care too much as the current between cells in parallel should be very low anyway. I would recomment first soldering and then spot welding to the cells, too. I’m not sure about your setup, but I can spot weld another strip of nickel over the first one to decrease resistance. I soldered a solid copper rod to the last nickel strips, this collects all the current from the parallel cells. With the test cells I usally made 4 test spots on the positive side to attach a nickel strip. You can then pull of the nickel strip. It should really leave holes in the nickel and parts of nickel on the battery. I still need to build the second battery, waiting on materials. 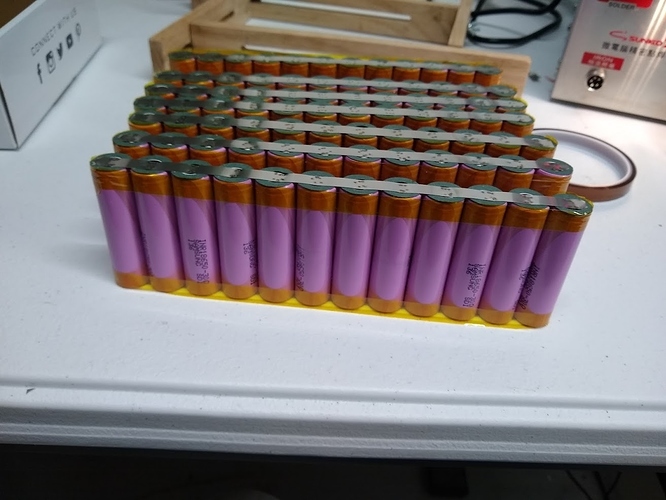 I probably will do some variation of what you guys suggest on the second battery. It was a mistake to try to fit so much into so little of space. After a huge amount of effort I have made the area available for the batteries about 5/16" wider. This is the lower level of the electronics. Looks compact. 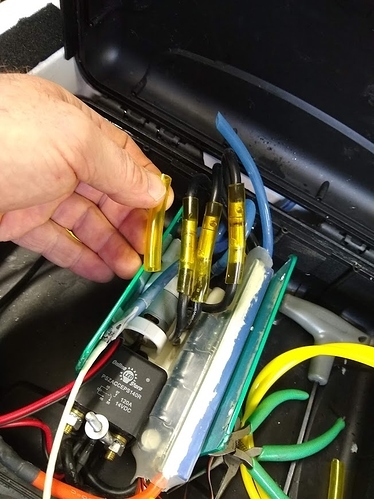 Is the big relay your main safety cut? Yes, that is my safety Relay. It is energized by 12VDC when my lanyard is attached. This is the same relay I used on my first build. It connects the ESC to the battery when energized. I do not use any type of anti-spark circuit. So far I have not had a problem with this relay. I printed the upper level base and mounted a clear piece of poly-carbonate in it so I could see through it. Now I am starting to assemble the upper level of my electronics. Because I want to be able to use a 14S battery I had to purchased a new voltage regulator to run my receiver 5VDC. And another voltage regulator 12VDC to pull in the safety Relay and power the water pump. Long story short, In my search for a power supply that would run on 14S I found these buck converters. They are the high voltage versions that can handle up to 60 volts in. I bought 2. One worked good, one crapped out at 12S. So I bought a replacement. That one worked. Input voltage to the buck converter measured was 59.5 VDC. 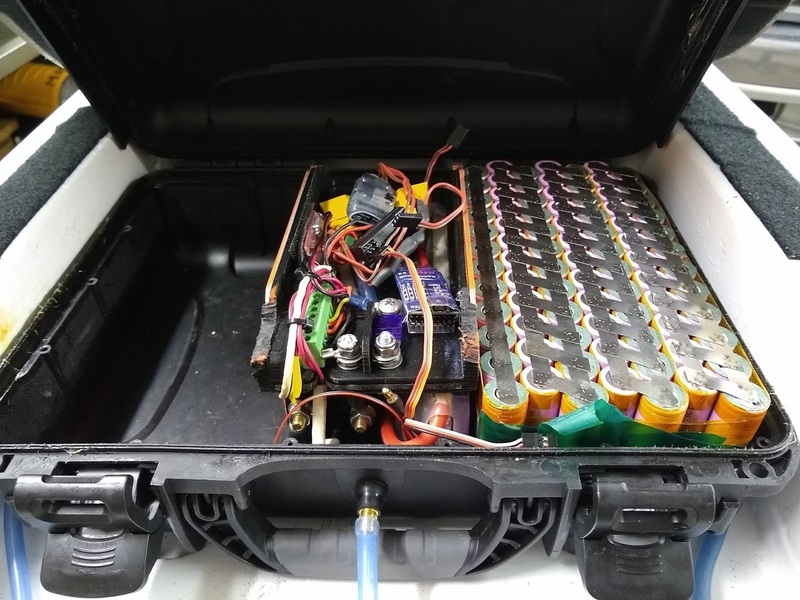 thats 12S batteries in serial with the bench top power supply. I adjusted the loaded buck converter for 12.15 VDC out. 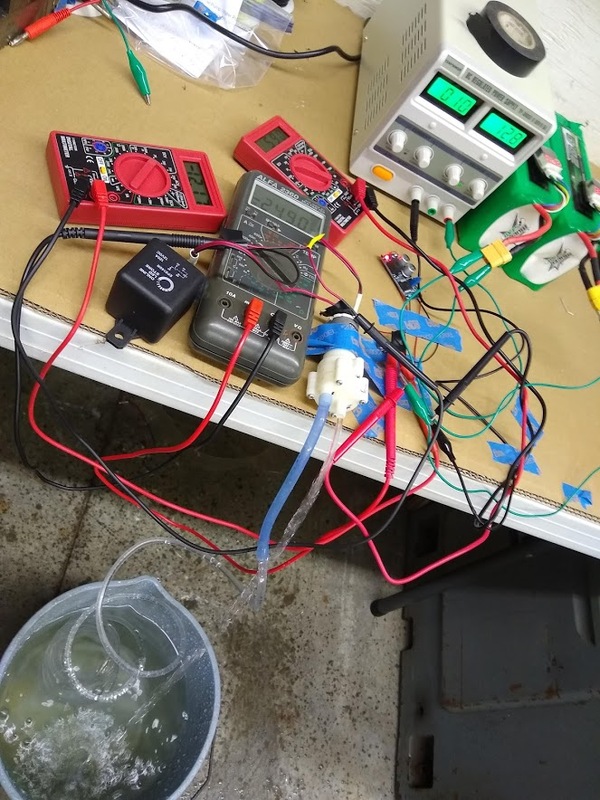 The safety relay and pump in parallel draw between 380 to 410 ma current, That is what I run in my application from the 12V supply. Note the pump alone draws about 240 mA. The room temperature was 50F. The hottest temperature I measured on the buck converter after 1 hour was 104 F.
Relay hottest spot was 81F. The pump hotest spot was 94F. Just when things were starting to look good. I was swapping out the old 12S buck converters for ones that could run on 14S input power. 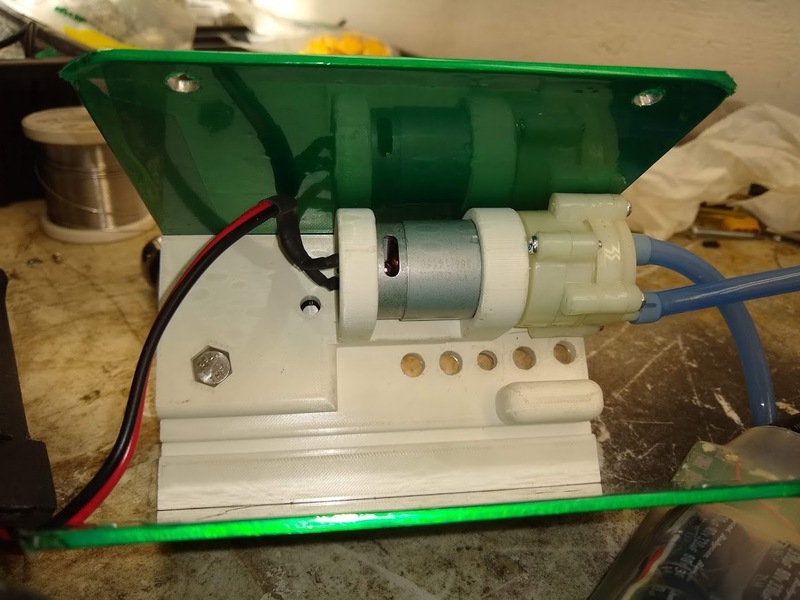 I made a mistake and installed the 12 volt buck converter where the 5 volt one was suppose to be installed. That fried my receiver and data logger. Now I am waiting on parts again.